A Gray Whale along the Northern Oregon coast. (photo from Coast Explorer Magazine). Just as Oregon families head to the beach for spring break fun, hundreds of gray whales will be visible traveling north along the coastline. One of Oregon’s two designated Whale Watching weeks falls March 23-March 31. 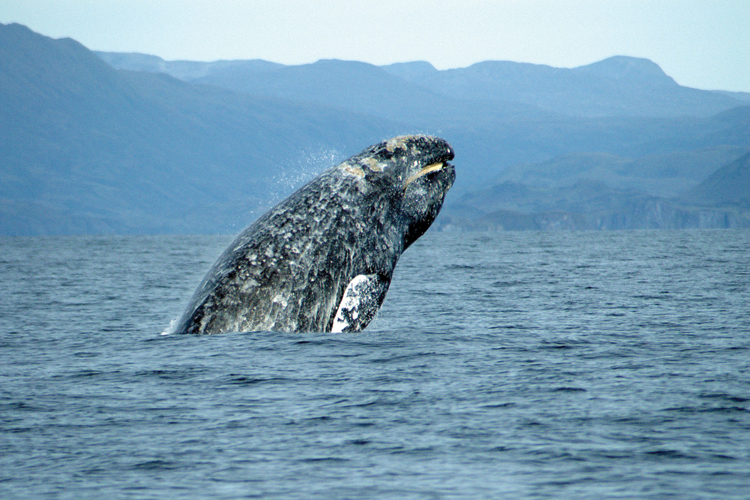 Each day, coastal visitors should be able to spot hundreds of gray whales. That’s because it’s the start of a great migration, which runs now through June. Twenty thousand whales will pass along the shoreline making their way home to Alaska. They’re returning from winter in the lagoons of Baja California where mamma whales fattened up and welcomed their newborns. Among the best places to watch for whales are from beach front balconies, like those at Tolovana Inn. Whales are spotted when they rise to the surface and spout a plume of mist and vapor that can reach up to 15 feet in the air. Calm days are best for whale watching, as the spout can linger in the air for up to five seconds when there is little wind. Seas without white-capped waves make whale spotting easier. And, early daylight from a low angle that illuminates the lingering spout also helps. With your binoculars, keep an eye out for a spout. Once you have it spotted, just raise your binoculars to where it was and keep looking. Whales typically spout three to five times, about 15-30 seconds apart, before making a deep dive of up to six minutes long. Once spotted, keep their direction of travel in mind. Then, you will have it down in no time. Getting up to look out over the horizon is critical. Therefore, another good spot is from nearby Ecola State Park, where “Whale Spoken Here” volunteers can point out the gentle giants and answer your questions. Sure, your kids might learn something during their break from school, but it’s fun stuff and there are no tests! Tolovana Inn is a spring break favorite for families, big or small. Just a few easy steps to the sand, our roomy oceanfront suites feature cozy fireplaces and private balconies with amazing views. And when its time to unwind, kids can play in the indoor salt water pool while parents relax nearby in the sauna or spa. For over 30 years, the Stormy Weather Arts Festival kicks off the first weekend in November, attracting art and music lovers to Cannon Beach. Make reservations now to stay at Tolovana Inn then prepare to enjoy all the festival fun, November 2-4. If you come down for the weekend, you can stay over Sunday night for 50% off your room rate. Then, you can enjoy a leisurely ride home Monday morning. 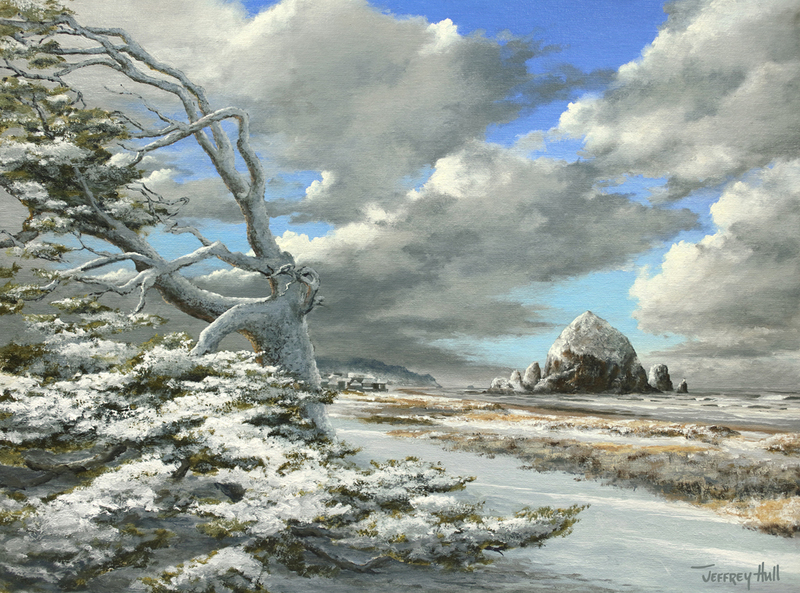 Cannon Beach is home to over a dozen exceptional art galleries. Many of the galleries’ most notable national and regional artists’ will be showcased during the festival. You can wander around the town, visiting art gallery after gallery, enjoying receptions and artists demonstrations. You can also catch free live music performances all weekend long at six music venues, both indoor and outdoor. The Jeffrey Hull Gallery is one of the sponsors of the Festival. Jeffrey controls the difficult medium of watercolor, often in very large paintings. He also works in oil paints. He is reknown for his ability to capture the beauty and moods of the places where water joins the land. 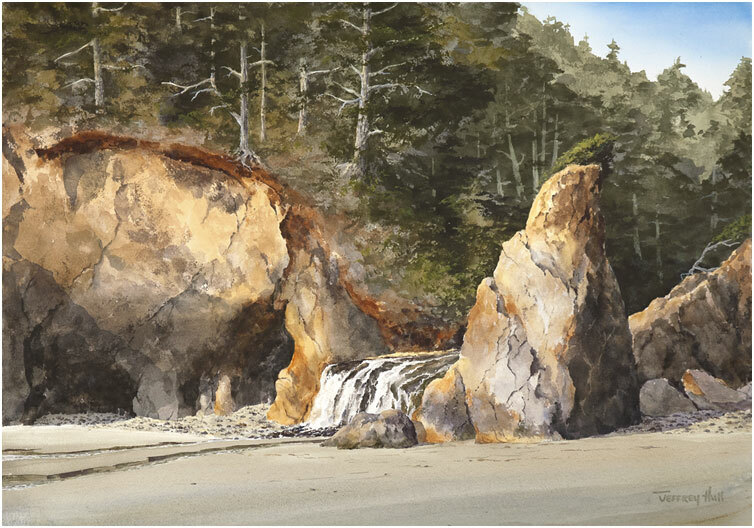 He and his wife Carol opened their Cannon Beach Gallery in 1987, where his original works, lithographs, cards, and books are available to admire and purchase. A concert showcase featuring Lloyd Jones is set for Friday night at the Coaster Theater. The Oregon-born soulful Jones has spent 30 years as a singer, guitarist, songwriter, performer and producer. Tickets for this intimate show in the Coaster are just $35. On Saturday night, legendary Curtis Salgado will headline a Coaster Theater performance. National Public Radio calls Salgado a “Blues icon” with a huge voice. The Blues Review declares that Salgado is “one of the most soulful honest singers ever. ” Like Jones, he is sure to bring down the house. Tickets for his concert are $40. You might bump into Salgado at the Tolovana Inn, where he and his band will be staying. The festival also includes “Dancing in the Rain” fashion show where you can pick out a new outfit. All apparel and accessories from local and national designers is available in Cannon Beach shops. On Sunday, the Festival wraps up with a Brews, Blues and BBQ lunch featuring local craft beers. Concert and other event tickets can be purchased online. You can book your Tolovana Inn room online or call 1-800-333-8890. The sun is shining on Cannon Beach and the forecast looks inviting! With summer crowds back-to-school, bright and crisp Fall days at Tolovana Inn are especially inviting. Tolovana Inn has just announced two seasonal specials that will make it hard to stay away. Visitors who stay three nights, Sunday through Thursday, will only pay for two nights. Or, if you come down for the weekend, you can stay over Sunday night for 50% off your room rate. Then, you can enjoy a leisurely ride home Monday morning, avoiding traffic and the Sunday sadness of leaving the Oregon coast. What will you do with more time to enjoy Cannon Beach? 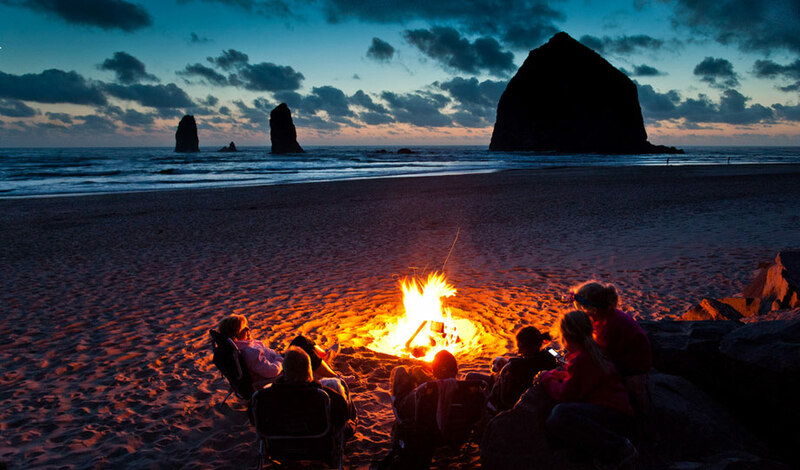 Stay over Sunday and you’ll have more time for beach bonfires. More time to explore Ecola State Park. 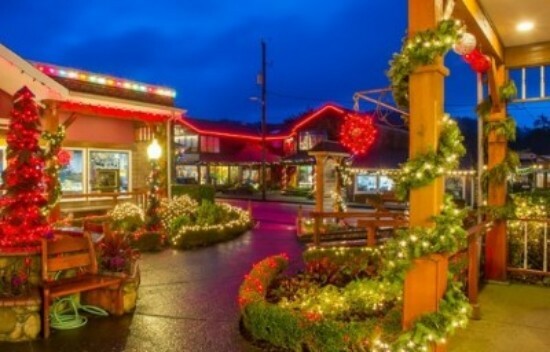 More time to browse the uniquely distinctive shops and galleries of Cannon Beach. More time to unwind in the pristine salt-water pool. Or just relax, stroll the beach, poke around tide pools or do whatever it is that makes you happy in Cannon Beach. Bonus: Attend the Stormy Weather Arts Festival, Nov. 2-4. This special Fall offer is valid through November 18. That is exceptionally great because it means you can enjoy special savings during the November 2-4 Stormy Weather Arts Festival. Over thirty years old, the Festival is one of Cannon Beach’s most popular annual events. The event focuses on a wide range of visual and performing arts, offering the opportunity to meet artists and discuss their work, listen to regional musicians, take in gallery events and experience why Cannon Beach has been recognized as one of “The 100 Best Art Towns in America.” This year’s line up includes concerts by Curtis Salgado and Lloyd Jones. Make plans now to stay at Tolovana Inn this fall. You can get a glimpse of coastal living in Cannon Beach, Oregon at the annual Cottage & Garden Tour, September 7-9. Historic inns, vintage homes, and special gardens will welcome guests to enjoy a weekend of special receptions, presentations, concerts, a garden tea, wine tastings, and even a costume contest. 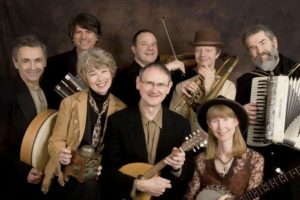 The annual event is coordinated by the Cannon Beach History Center & Museum which celebrates the town’s heritage as a coastal destination community. Two of the weekend special events are hosted at the Tolovana Inn. 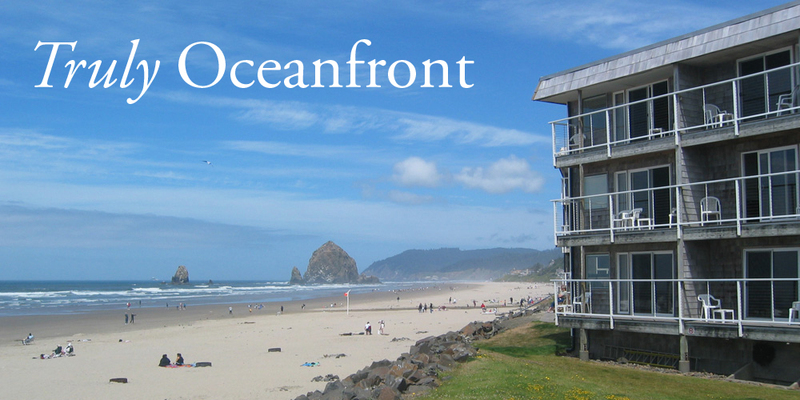 Cannon Beach has been a destination community since the 1880’s. In fact, in an August 1891 issue of The Daily Astorian newspaper, Cannon Beach was declared a “sportsman’s paradise.” Additionally, it was heralded as an “ideal location for rest and recuperation.” Still true! Cannon Beach has emerged into a picture-perfect destination of unmatched charm. And during this special weekend, you can experience it in an extraordinary way. The tour kicks off at noon, Saturday, starting at Tolovana Inn, with a riveting presentation by Oregon author William (Bill) Sullivan. Sullivan is a fifth-generation Oregonian and a prolific writer, adventurer, hiker, and historian. 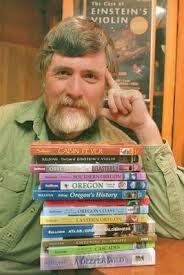 His award-winning books delve into Oregon’s legendary, unknown, and often strange past. His talk will focus on the history of Cannon Beach and the trails and roads used to access them – and some history about Governor Oswald West. West was governor from 1911 – 1913 and due to his efforts, is one of the major reasons that our beaches are open to the public. Tour maps will be distributed there. 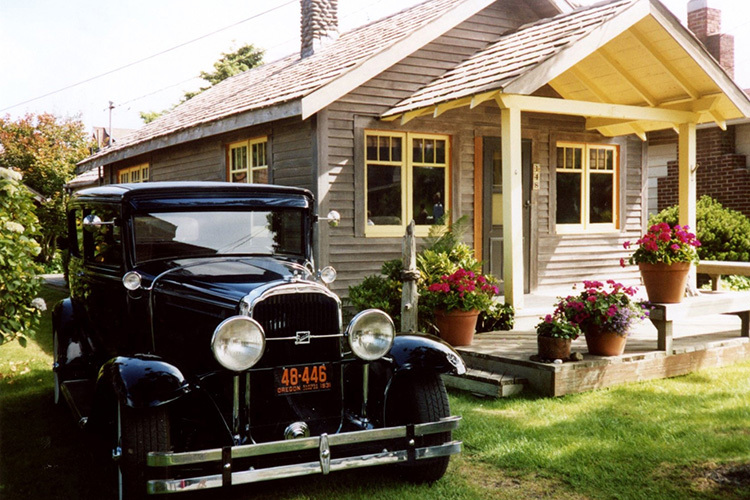 Tickets for individual events or a weekend package can be secured through the Cannon Beach Historical Center & Museum. The R.J. Marx Quartet features a world-class frontline of saxophone and guitar exploring some of the most challenging and rarely performed compositions of the major jazz composers from the ’40s -’70s, as well as traditional favorites. Tickets to this event are $15. Keynote speaker Bill Sullivan. The luncheon will be prepared by the notable bakers, chefs and sommeliers of Dough Dough Bakery, of Seaside. Held at the Tolovana Inn, tickets for the luncheon and lecture are $25. Attendees to this event will receive the home tour map at the luncheon. Highlight include ten vintage homes, beach dream homes and well-tended gardens of mid-town Cannon Beach. Tickets for the self-guided tour are $35 and include the Saturday night jazz concert. After the tour, the festivities continue with the 1920’s themed concert and reception at the Cannon Beach History Center & Museum. Admission is free with your tour map. Additional tickets can be purchased at the door for $15. Don’t miss out on the 1920’s themed costume contest, tasty treats, wine, a raffle, a photo booth, and dancing. The final event of the weekend is an English style garden tea at Tolovana Inn. Enjoy tea, scones, cucumber sandwiches and other tasty morsels from Dough Dough Bakery. Nationally recognized garden designer and writer, Lucy Hardiman will speak at this showcase event. She is the owner and principal of the award-winning Perennial Partners, a collaborative garden design group in Portland, Oregon. Tickets to this event are $20. Proceeds benefit the Cannon Beach History Center and Museum, a non-profit organization. A stroll along the Cannon Beach coastline is one of life’s simple pleasures. But for people with limited mobility, it’s a near impossibility. Until now. 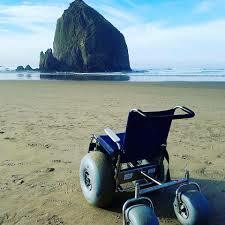 Thanks to the non-profit Haystack Rock Awareness Program and the City of Cannon Beach, visitors to the coast can reserve one of two beach wheelchairs designed with “fat balloon tires” to provide mobility on the sand. Andrea Suarez coordinates the program and takes reservations from coastal visitors. Since January, the beach chairs have been used over 120 times. There is no charge for the wheelchair use, but donations are accepted. “People are so grateful. Some people haven’t been able to get their toes in the water for over 25 years and they are so excited,” she said. In gratitude, one gentleman handed over $6, all the cash he had. Another contributed $200 for the pleasure of rolling along in the sand. 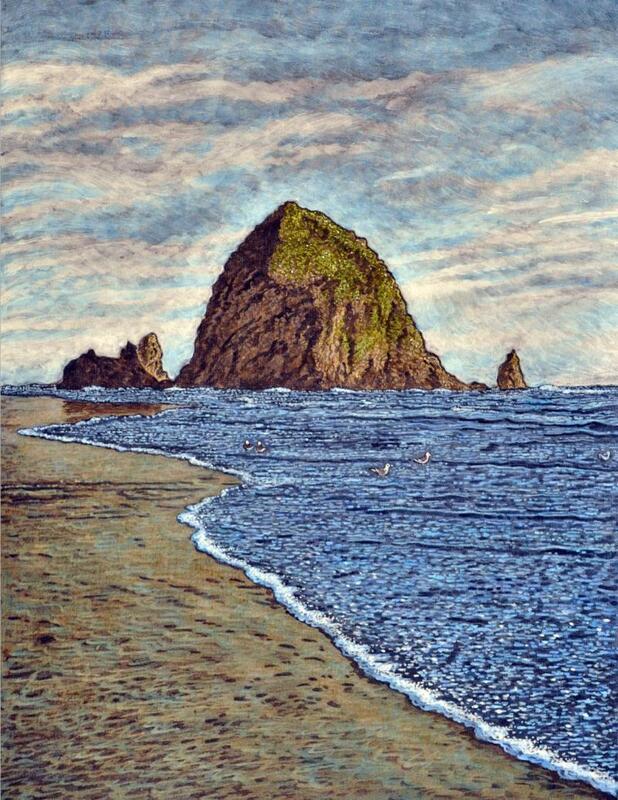 Contributions to help fund the program can be made online at the Haystack Rock Awareness Program. Now through October, the chairs are available by reservation from 8:30 to 4:30 by calling 503-440-2598. November through January, the hours are 9am to 4pm. Users pick up the chairs at City Hall, complete a liability waiver and return the chairs at an agreed upon time, usually 2-3 hours. Tolovona Inn offers oceanfront ADA rooms. Call for availability. July 4th Parade in Cannon Beach: Puffins too, but no fireworks! 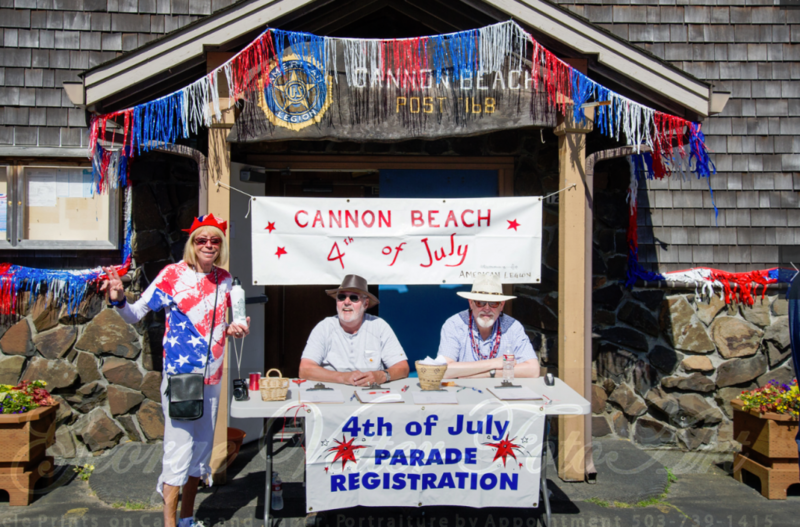 A rousing small-town parade and The Great Cannon Beach Puffin Watch are among the fireworks-free Independence Day festivities in Cannon Beach. From classic cars to decorated bikes, homemade floats and star-spangled dog walkers, everyone is welcome to celebrate our freedom and honor Cannon Beach veterans by participating in the parade. If you want to be in the parade, registration starts at 9 am at the American Legion Hall. Cost per entry is $5. You can pick up patriotic hats and kids can enjoy face painting. If not, pull up a chair curbside and enjoy the show! The parade gets started at 11 am in midtown. After the parade, head to the shore. With Haystack Rock, a National Wildlife Refuge, at the edge of the shoreline, fireworks are not permitted on the beaches, protecting the seabirds and natural environment. Families and pets, both popular in Cannon Beach, won’t miss the noise or the debris caused by fireworks. So, wave a flag to honor our great nation and uniquely beautiful Cannon Beach. If you can’t make it down to stay at Tolovana Inn for the mid-week holiday, make plans to visit soon! Cannon Beach’s 54th annual Sandcastle Contest was featured last night on the NBC Nightly News. Anchorman Lester Holt, who recently visited the Portland area, narrated the story that wrapped up the evening news broadcast. With Haystack Rock as a backdrop, drone photography showcased the incredible sand creations. It also showed how the tide washed away the notable efforts. Masters and amateurs compete in the one-day event. One featured family shared how they have gathered for 9 years of competitions. The Cannon Beach Sandcastle Contest anchors their annual family reunion. 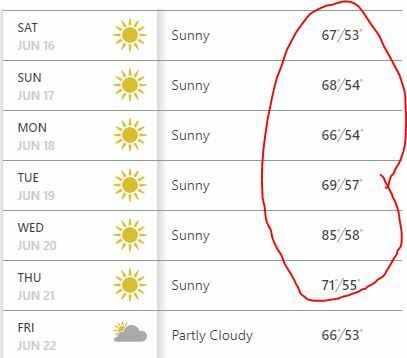 The forecast for Cannon Beach looks ideal. Next week, the Portland area and Willamette Valley area temperatures creep up in the 90’s, nearing triple digits. Too hot for most folks. But, you’ll find relief from the heat at the Oregon coast. At the Tolovana Inn, in Cannon Beach, the forecast calls for sunny, bright days, approaching 70 degrees. Wednesday might hit 85 degrees. But the nights will be invitingly cool, perfect for resting with open windows and the sound of the surf to lull you to sleep. Long, sunny days underscored with fresh, salty sea air, combine to create a refreshing atmosphere perfect for strolling the beach, bike riding, hiking and browsing around town. Beautiful flowers are in bloom throughout the town, both wild and those beautifully landscaped. Clear skies lead to bright sunsets and starry nights. On Tuesdays, between noon and 5 pm, be sure to stop by the Cannon Beach Farmers Market. The Market is now open weekly, June 19 through August 28. You’ll find fresh seafood, meats, produce, berries, and baked goods, along with live music. It’s located in mid-town, at Gower Street. Find something tasty and prepare it to your liking in the kitchen of a Tolovana Inn suite. Add an local Oregon wine or ale, and enjoy your fresh feast on your private balcony, watching the sunset. Can’t get any better than that! Book a stay between Sunday through Thursday, and you can take advantage of the final days of the special 3 nights for 2 offer, valid through Thursday, June 21. That happens to be the first day of summer. 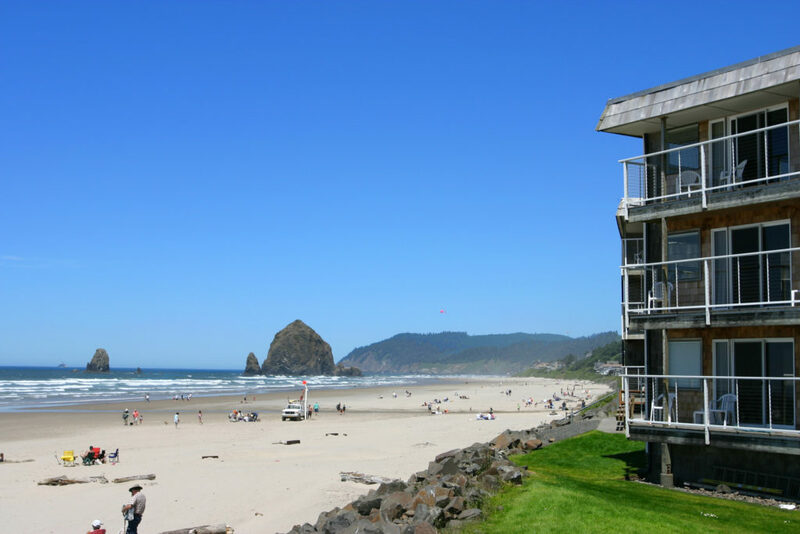 Make your own summer memories at the Tolovana Inn in Cannon Beach.